In the United States, digital television broadcasts, or DTV, can be received via cable, via internet, via satellite, or via free over-the-air (OTA) digital terrestrial television - much like analog television broadcasts have been. Full-power analog television broadcasts, however, were required by U.S. federal law to cease by June 12, 2009. Low-power, Class A, and TV Translator stations are not currently required to cease analog broadcasts. Also by law, digital broadcasts - when transmitted as OTA signals - must conform to ATSC standards. ; it is unclear whether satellite operators are free to use their own proprietary standards; and many standards exist for Internet television (most are proprietary). 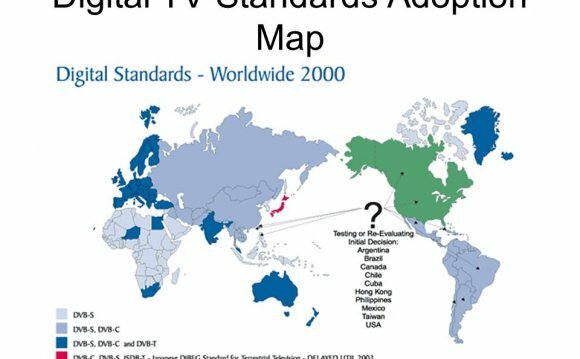 The U.S. opted to adhere to ATSC standards for broadcast digital television. These standards define, among other things, format and transmission criteria that ensure consistency, accessibility, and fairness for consumers and equipment manufacturers alike in the U.S., as well as international compatibility. Currently, most Americans get digital television broadcasts via cable or satellite. Digital cable television systems with an activated channel capacity of 750 MHz or greater, are required by the FCC to follow ANSI/SCTE transmission standards with the exception of cable systems that only pass through 8 VSB modulated signals. Digital television sets (equipped with ATSC tuners) are often capable of viewing a baseline set of unencrypted digital programming, known as basic cable, which typically include local network television affiliates. According to FCC regulations, the remaining encrypted channels must be viewable with a receiver equipped with a CableCARD. Digital television transmissions over-the-air (OTA) are now available in most metropolitan areas in the U.S., often carrying both standard-definition and high-definition (HDTV) transmissions of the same stations. In fact, by the analog shut-off date of June 12, 2009, all Full Power OTA stations in the U.S. will, by law, have to either transmit their broadcasts digitally, or shut down. Many stations have already used the switch to digital transmission as an opportunity to transition from 480i broadcasts to digital HD OTA broadcasts (either in 720p or 1080i), though this change is voluntary. Within a distance of 35 to 40 miles from the broadcast stations, it is possible that no equipment more special than perhaps a simple antenna (such as "rabbit ears") may be necessary to receive a DTV broadcast signal OTA—at least some of the time for some of the channels. Any television equipped with an ATSC tuner may display DTV broadcasts properly. Some customers are already discovering that terrain, trees, rain, snow, wind, and even the movement of people around the room interfere with reception to one degree or another, from signals breaking up to total loss of signal. (Few ATSC-equipped televisions or converter boxes have internal antennas, in contrast to analog sets available in years past). It was estimated that as of April 2007, 28% of American households had an HDTV set, a total of 35 million sets, and that 86% of owners were highly satisfied with the HDTV programming Estimates are that by the end of 2010, some 59% of American TVs had transitioned to HDTVs. All TV stations currently broadcast in both digital and analog and major networks broadcast in HD in most markets. While many in the industry wanted a flexible or delayed deadline, the FCC forced the issue at the behest of Congress. Congress wanted to reclaim some of the spectrum used for analog and repurpose that for emergency services. They also wanted to auction off bandwidth between 76-88 MHz frequencies (channels 5 and 6)and old analog UHF channels 60 to 69, and channels 52 to 59 by mandating DTV tuners be phased into all new TV sets. Many transition dates were proposed, but Congress finally fixed February 17, 2009 (later extending it until June 12, 2009), in law as the maximum end date for analog television authorizations. Because this date comes after the NCAA's Bowl Championship Series and the NFL's Super Bowl XLIII, there will be less of a chance of an acute hardware shortage from people waiting until the last minute to purchase an ATSC tuner than there would have been with a January 1 cutoff. The original deadline of January 1, 2006 was abolished when it was realized that TV stations and customers would not be able to meet the earlier deadline. Ultimately, VHF Channels 5 and 6 were retained for digital broadcast television use after the transition, though the FCC had continued researching the possibility of re-allocating the two channels to an expanded FM band. On August 22, 2011, the United States' Federal Communications Commission announced a freeze on all future applications for broadcast stations requesting to use channel 51, to prevent adjacent-channel interference to the A-Block of the 700 MHz band. On December 16, 2011, Industry Canada and the CRTC followed suit in placing a moratorium on any future Channel 51 television station applications.